These Fellowes premium self adhesive laminating pouches are ideal for laminating important documents that are sensitive to heat. They are also an excellent choice for individuals who don't have a laminator. Self Adhesive laminating pouches (sometimes called Cold Laminating Pouches) can be used to laminate concert ticket stubs, ultrasound pictures or other thermally printed documents. These pouches are available in a variety of sizes and are extremely easy to use. Simply position your document in the pouch, remove the adhesive backing and seal. It doesn't get much easier than that. These pouches can be used without a laminator or they can be used with any pouch laminator that has a cold setting. Pouch Dimensions: 11.5" x 9"
Welcome to MyBinding.com. 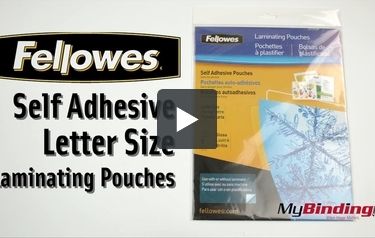 These are the Self Adhesive Letter Size Laminating Pouches from Fellowes. For documents and photographic prints that don’t react well to thermal lamination, use Fellowes self adhesive laminating pouches. Align your document or photo, remove the small adhesive liner strip to set the document, then remove the rest to seal it all up. You don’t even need a pouch laminator, but you can use one on the cold setting to squeeze out any air bubbles. For more videos and all your binding needs, go to MyBinding.com.